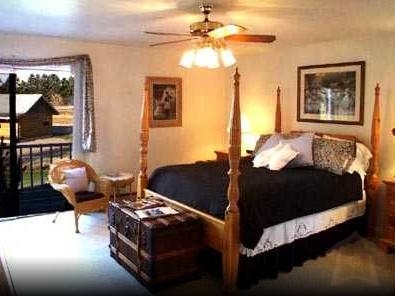 The Main House at Bad Rock Bed & Breakfast brings a Big Sky flavor to the traditional bed and breakfast experience with three distinctly different guest rooms. Two of the rooms are on the upper level, seven steps up from the main floor, and one is on the lower level, seven steps down. Each has its own private bath, hair dryers, air conditioning and private phone, plus a spectacular view. An iron and ironing board are available upon request. Room One, Big Mountain, on the upper level, overlooks the garden and Bad Rock Junction. A private west-facing balcony has spectacular sunset views over Big Mountain. With a queen bed and European decor, it has a private bathroom with a tub/shower combination.